The Greek empire predates the Roman empire and is considered as the beginning of the western civilisation. 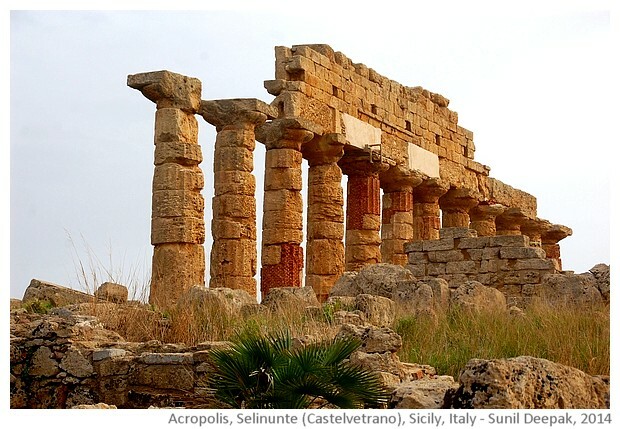 Around 700 BC, Greeks colonised parts of the Sicily island in the south of Italy. 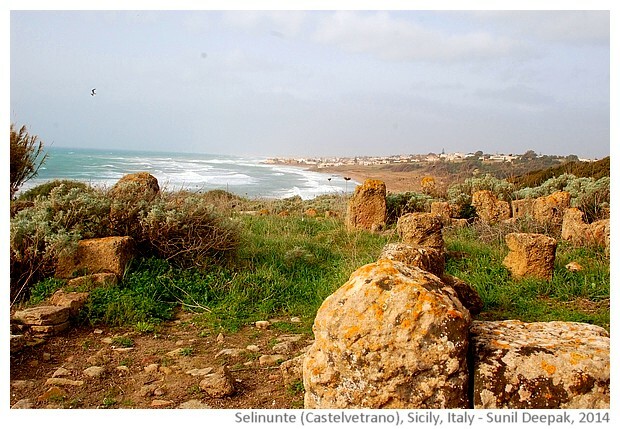 This post is about the ruins of that Greek empire in a place called Selinunte, near the city of Castelvetrano. South West part of Asia (Middle east), neighbouring Africa and the countries surrounding the Mediterranean sea played an important role in the beginning of human development with Mesopotamian, Babylonian, Assyrian and Egyptian civilisations. The first agricultural societies and skills like writing developed in this part of the world. These civilisations had close contacts with civilisations developing in the east, especially in India and China. The rise and fall of the Greek civilisation was part of this process. The Greek empire began in 800 BC and lasted for about 3 centuries, being replaced by the Persian Achemenid empire. Greeks gained ascendence once again with Alexander in the fourth century BC, who extended his empire to the western boundaries of India. However soon after Alexander, the Roman empire began to dominate this region. 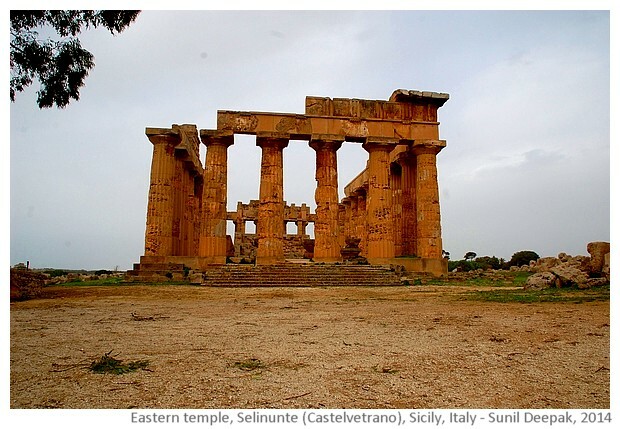 Selinunte in western part of Sicily holds some magnificent signs of the early Greek Empire, that had a strong influence on the Romans, defining their cultural, religious and aesthetic ideas. When Roman empire grew into northern and eastern Europe, it took those Greek ideas to all its new colonies, influencing their cultural ideas. Thus Greek civilisation is considered as the mother of the Western civilisation and the basis of the "classical" culture. 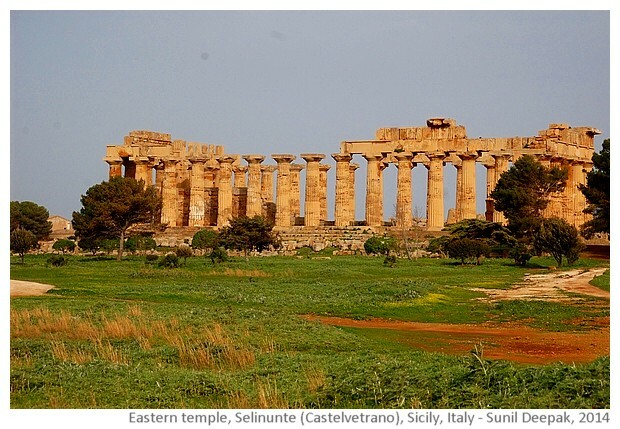 The first Greek colonies in eastern Sicily came up in the eighth century BC. Over the seventh century BC, many colonies extended towards the west. 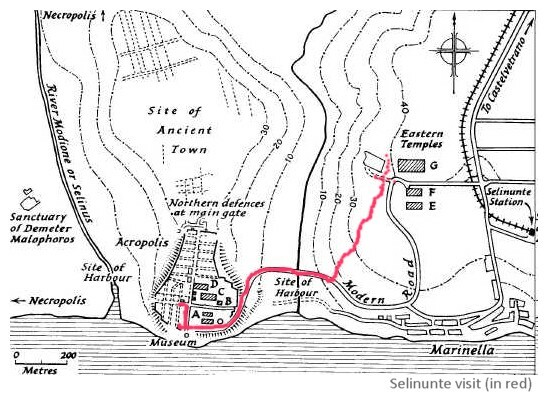 Selinunte, near the Selinus river (called so because of wild celery growing there and in Greek, celery is called "selinon") , became one of the biggest Greek cities in Western parts of the island. 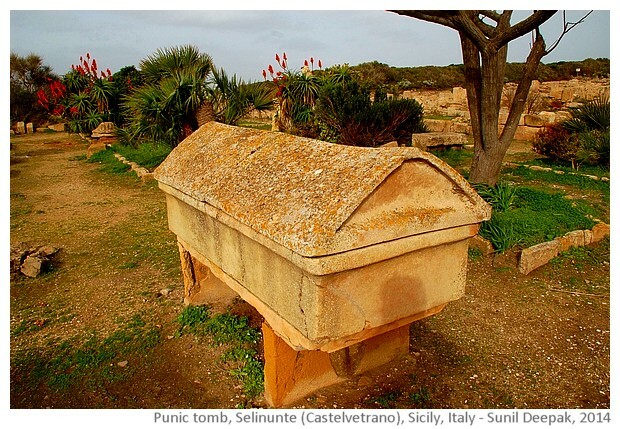 However, across the sea in what is now Tunis, Punic groups (of Phoenician origins) had established the Carthage empire and there were frequent fights between the Sicilian Greeks and the Carthage. 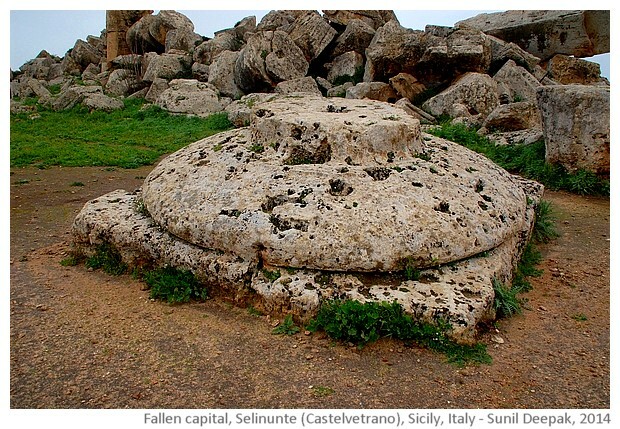 Around fifth century BC as the power of the Greek empire waned, Punics occupied and destroyed Selinunte. 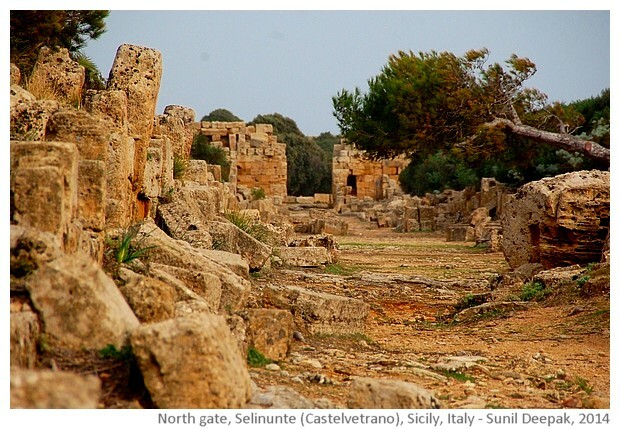 In second centry BC, Carthage was occupied and destroyed by Romans and thus, Selinunte was definitely abandoned. 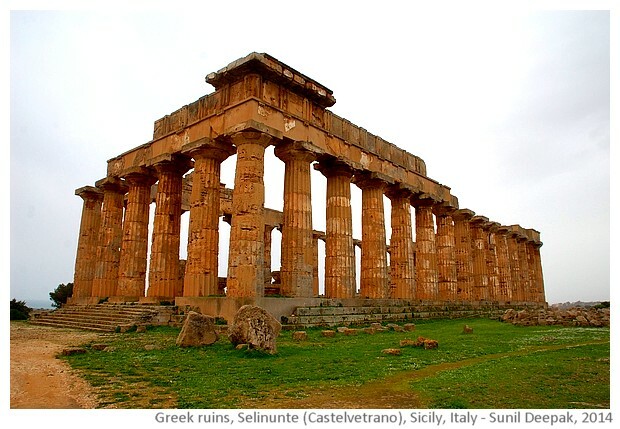 The remaining magnificent buildings of Selinunte were destroyed by an earthquake sometime around seventh-ninth century AD. In 20th century, a few of the buildings of Selinunte have been reconstructed using the stones from the ruins. 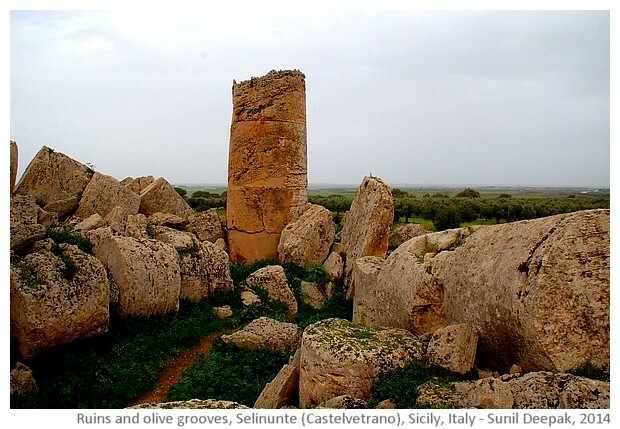 While in Castelvetrano, one morning I was free for a couple of hours, so I asked my friend Piero to accompany me to Selinunte, about 12 km from Castelvetrano. Piero has a house in Selinunte and was happy to oblige me. 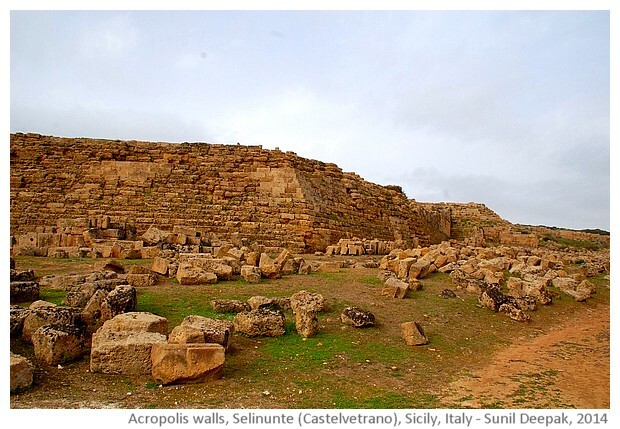 Selinunte archaeological area is huge and requires at least a day for a proper visit. In the couple of hours we had, a full visit was not possible. Thus we limited our visit to the temple and ruins at the eastern hill and then to some parts of the Acropolis. Our walking tour is shown in red in the map below. 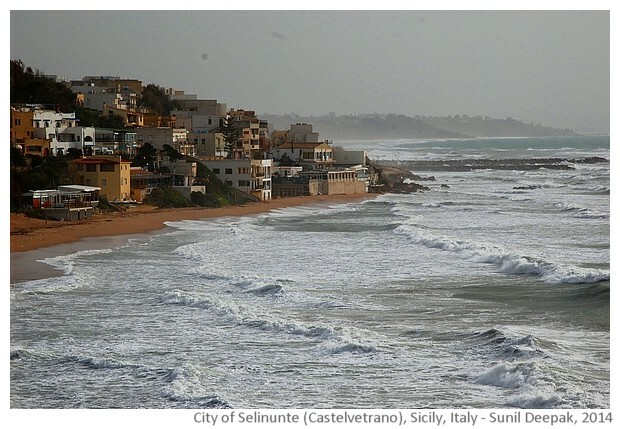 Selinunte is a seaside town where many of my friends in Castelvetrano had their holiday homes, where they usually spend some months in the summer. Here is glimpse of the Marinella part of Selinunte houses close to the sea. 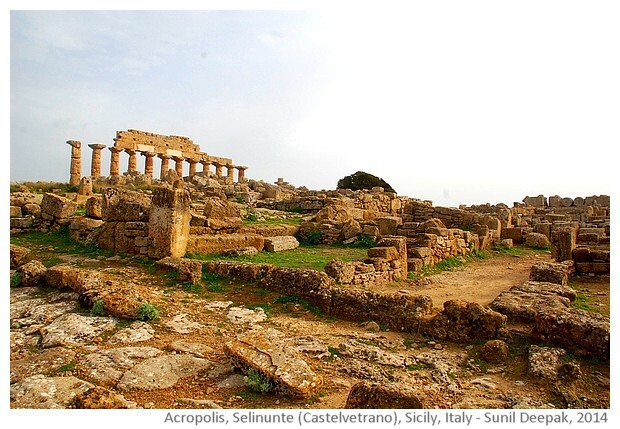 The main city of 7th century BC Selinunte was in the south, closer to the seaside, at the Acropolis. However, some important temples and buildings were built at the Eastern hill. One such building, the Temple of Hera, has been rebuilt partially and gives an idea of the way this place must have looked before its destruction. Similar to the Parthenon in Athens, the temple is built on a raised rectangular platform with stairs all around it. It is surrounded by 16 columns on the longer sides and 4 central columns on the short sides. The columns are Doric - this means, they stand flat on the pavement without a separate base and the sides have 20 parallel grooves. At the top, the columns are composed of three elements - the smooth and flared capital connected to the square Abacus on which rests a horizontal beam (architrave). Next to the temple there are other ruins where you can see an upside down flared capital and a square abacus, that shows that the two parts were joined, cut from the same rock. 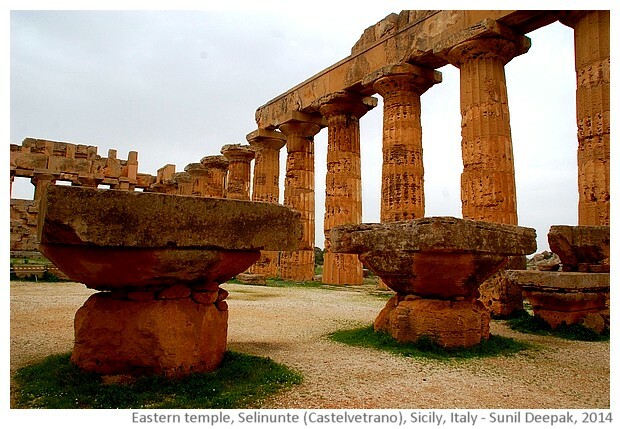 The round stones used for the columns and the capital have square holes, for connecting them to other stones of the column with the help of iron. The stones are from a lime rock quarry situated at Cusa, 13 km away. It is humbling to think of all the work that must have gone into cutting these stones from the rocks, shaping them, making grooves in them and then fixing them one over another. The Greeks made their cities at the top of the hills and thus these are called Acropolis (high cities). The walk from the eastern hill to the south towards the sea, was very pleasant. I was struck by the colours of the countryside where the dry straw coloured high grass contrasted with the green hills. 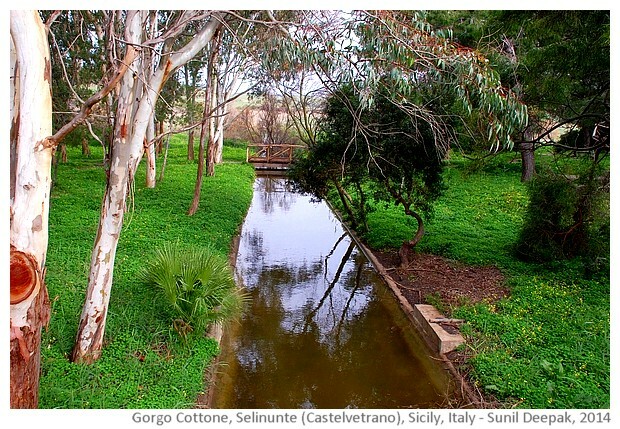 As we reached the bottom of the hill, we crossed the Cottone river, that looked like a small canal rather than a proper river. Another bridge near by was over some dry land. Perhaps the main river was dry now and just a canal is enough to carry all the river water? According to the map, nearby was the old harbour of the Greeks. The climb towards Acropolis brought us to the walls of the old city that had managed to survive the earthquake. The ruins in the Acropolis are spread over a huge area and include different temples, roads, gates and houses. We were already getting late so it was a hurried visit to some of the buildings in this area. 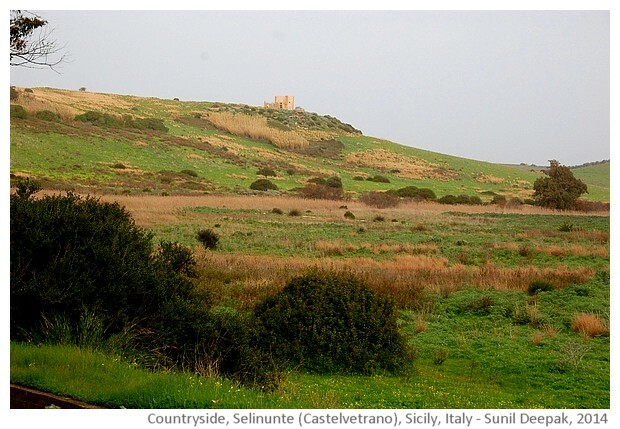 On one side, we could see the sea and the houses of Salinunte in the distance. Going down on that hill would have brought us to the Salinus river and to the ruins of Malaphorus temple on a hill. But there was not enough time to do that visit. On our way back, we passed some Punic tombs in raised up stone graves. I was surprised to see plants of Aloe Vera in this area, that I had seen in Cape Town in South Africa. Perhaps the two places share similar environmental conditions! Then it was time for us to rush back as I was getting late for my meeting. It was a cold and rainy day and there were hardly any other tourists, so the ruins seemed even more desolate and beautiful. To close this brief walking tour of Greek ruins of Salinunte, here is another image of the beautiful temple of Hera on the Eastern hill. 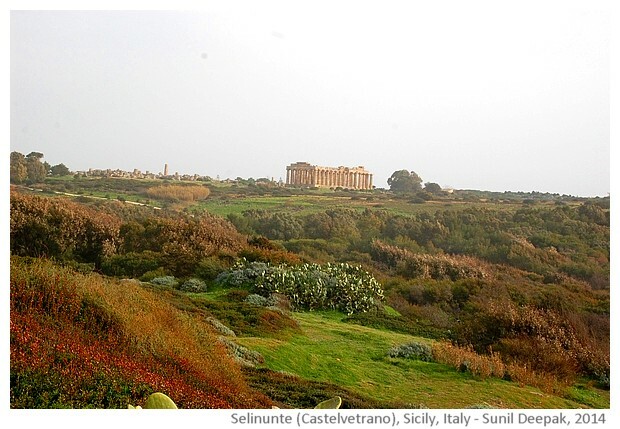 If you are ever in Sicily, think of visiting Selinunte! It is worth a visit. Greece, one of the ancient seats of civilization never ceases to amaze me.